Spend a week or more at Star Point, and experience summer in Maine, the way life should be! Our comfortable cottage is situated at the wide end of Messalonskee Lake (aka Snow Pond), in the famous Belgrade Lakes chain. Located at the waters edge, our camp was built in 2004 and features an open floor plan with 180 degrees of lake views from our deck on the point. 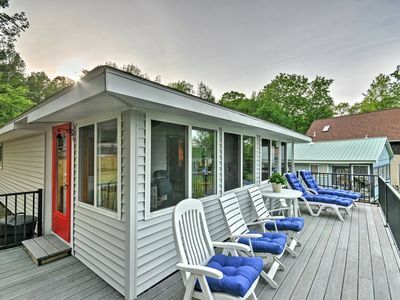 Two decks and a porch offer plenty of outdoor seating in the sun or in the shade - where you will enjoy spectacular sunsets, the call of the loons, and gorgeous night skies. Inside, the kitchen is a cook's delight and you can't beat those views. If you would rather just toss something on the grill as you toss a salad, that will work too! The main bedroom is on the first floor, with a king-sized bed, 2 dressers, and large closet. The bath is small but efficient, and is also on the first floor. Kids enjoy the loft bedroom with its cozy nook where they have a birds-eye view of the lake and first floor. The loft has a queen-sized bed a Twin Size Bed and room for sleeping bag or two. The property is nestled in a small cove with a sandy bottom, great for swimming, fishing, or just floating. We have a large dock for your boat and easy access stairs off the dock leading to a nice sandy spot. For fishermen, Snow Pond is a dream spot. The lake was named one of Americas 150 Best in 2007 according to Field & Stream. Trout, Bass and huge Northern Pike, are all here waiting for you to cast a line. Seasonal cottage with 2 bedrooms, 2 bathrooms, screened in porch, & loft with four twin size beds. Sits a mere 20+- feet from the water’s edge, with water frontage on Messalonskee Lake. Parking is conveniently located in the front of the cottage. This condo sits on the east shore, offering great sunsets. The lake is just over 8 miles long & has a max depth of 113 feet. Shared dock available for a boat. The property is a spacious waterfront camp located on the shores of Great Pond in Belgrade available for nightly, weekly or monthly rental. This home has three bedrooms, sleeps 6 people comfortably, has 2 bathrooms, large living room, large kitchen, and a beautiful deck. The home is an ideal choice for a larger family. 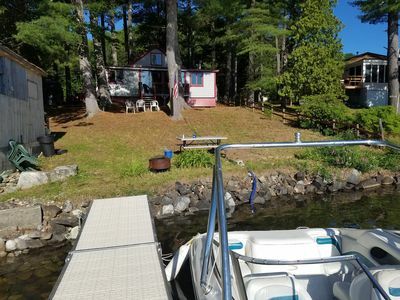 Located directly on the water, has a private dock, mooring , grill and Wifi as well as plenty of deck chairs to relax in and watch the loons, eagles, and ospreys. The property also includes 23 acres that can be explored and boasts beautiful views and wildlife. Bring your kayaks, canoes, or boats. Home has a private dock and there is a public boat launch nearby. The Launch is located off of Sahagian Road on Public Boat Launch Road in Belgrade. Enjoy grilling and dining on a lakeside deck with beautiful views of the sunset over the water. 92 Lord Lane is ideal for quiet vacations, fishing trips, or family reunions. No smoking inside please! 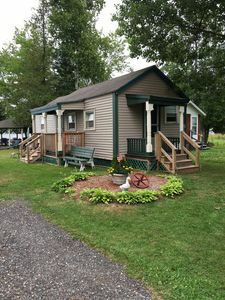 This adorable 3-bedroom cottage is both rustic and comfortable, nestled in peaceful Oakland on Salmon Lake, part of the Belgrade chain of Lakes. This is a great getaway spot for couples and for families with children. Start your day with a cup of coffee on the screened in porch looking across the clear lake. Enjoy the private dock and float, perfect for sunning, splashing, swimming and fishing. Got a boat? Bring it along and use our mooring Perhaps your favorite part of the day will be watching the beautiful sunset over the calm lake. After dark, join together around the fire pit for a camp fire, sharing laughs, roasting s’mores and listening to the loons. The house has 3 cozy bedrooms. One facing the lake with a queen size bed, another with twin size bunk beds and the final room also features a queen size bed. Relax in the cozy living room, featuring a flat screen TV, vaulted ceiling and skylight windows. Features include a fully functioning kitchen with pass thru window, full-sized refrigerator, a washer and dryer and small bathroom. As well as a screened in porch with outdoor furniture and grill. Enjoy meal time inside or gathered around our large outdoor picnic table. The property is located in Oakland, just a short 10 minute drive into Waterville or 15 minutes to Augusta, where you’ll find many shopping options, wonderful restaurants and entertainment. This new camp is something special. Constructed in the traditional Maine camp style, it has been wonderfully put together by local craftsmen and has beautiful, bright varnished pine interior v-match walls. For maximum privacy the home is situated approximately 200 ft from the lake, surrounded mostly by trees with peeks of the water. The private waterfront area which is exclusive to guests consists of a waterfront deck, swimming area with ladder, and dock extending out over the water. There are also offshore boat moorings. It is possible to drive to within 25 ft of the water if desired. The main level offers a roomy modern kitchen with all new appliances, black granite tile and a 9 foot bar area. The dining area and living room offer a wonderful open floor plan. The main level also has a large screened porch which is perfect to curl up and read a book or just enjoy the wonderful natural setting. The master bedroom and full bath are located on the main level. Up the stairs there is a roomy loft which has two twins and couch. Perfect for games or another spot to kick back and relax. Down the 'catwalk' there is the large 2nd bedroom which has a full sized bed as well as 2 twins. A door leads to a smaller upper deck. The 3rd and lower level is a walk-out basement with TV area, bar, an additional sleeping room with full sized bed, and a full 2nd bathroom. There is a washer/dryer in the laundry room. Heat is available to take the edge off cool nights for those enjoying early spring or our colorful fall leaf season. Tons of Fun at the Waterfront At the waterfront is a new dock, private swimming area, BBQ area with waterfront deck, a buoy to attach your boat and/or watercraft to. The waterfront deck is large and a great spot for dining and enjoying sunsets at the water's edge. 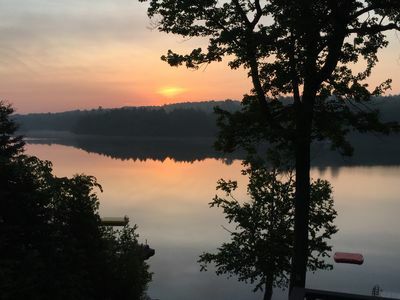 From this very popular location on the Eastern side of Pinkham's Cove, you can boat all over Great Pond, ride your boat in to Belgrade Lakes village, and enjoy picture-perfect sunsets. The shore also has car access to as close as about 25 feet from the water, which is very convenient for loading/unloading kayaks, canoes, and the like. The Belgrade Lakes area is known best as the inspiration for the story and film On Golden Pond. The lakes in the area (7 beautiful interconnected lakes) offer great boating, fishing, water skiing and of course swimming. Enjoy the day at the lake or going through the countryside shopping treasures and antiquing. If you prefer a game of golf, the highly acclaimed course in Belgrade Lakes Golf Course is located just minutes away. A day trip to Bar Harbor, Freeport or Camden lets you enjoy more of what the great State of Maine has to offer and all are easily accessible from Belgrade. Bring your boat or rent one and spend the day on any one of the seven incredible and beautiful lakes in the area. Boat/kayak rentals are easily available at several locations nearby. All these vendors are familiar with this cabin/property. Private lakeside modern camp perched on a hill surrounded by trees with glimpses of beautiful Great Pond! Be among the first to stay in this newly built westerly facing camp perched on a slope 275' feet from beautiful Great Pond. Enjoy beautiful sunsets and sunrises in a serene setting only 1 hour from Portland, Maine. The camp is perched on a hill surrounded by tall trees with the glistening lake below. 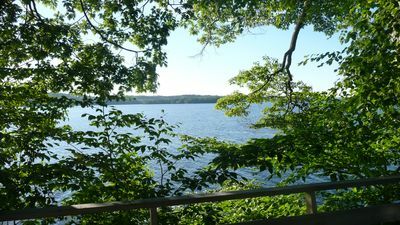 Access the shore by walking a meandering down-hill path through the woods right to the lake with your own private dock! Enjoy a day of swimming, lunch picnics, fishing or even an afternoon nap while listening to the loons. If you’d like to explore beautiful Great Pond by water - you may rent kayaks or launch your own boat at the public boat launch and ride it to our private mooring. Inside the bright modern camp, find a fully equipped kitchen, and a living room with 3 sliding glass doors that open to an expansive deck equipped with a gas grill -- perfect for enjoying dinner and drinks outdoors or just a place for relaxing under the sun or star gazing at night. The camp has 3 bedrooms and one sleeper sofa - perfect for 6 guests but could accommodate 8. Downstairs you’ll find a bedroom with a queen bed, bathroom with a standup shower and a queen pull-out sofa in the living room. Upstairs there are 2 bedrooms – one with 2 twin beds (with storage drawers) and the other with a queen bed along with a bathroom with a full bath. A close drive from camp, find the quaint village of Belgrade Lakes that will take you back in time with its old fashioned general store and ice-cream shops. Also, nearby, find, hiking trails, Winterberry Farm (great homemade pies and chutneys and jams) and Belgrade Country Club for golf lovers. In nearby Waterville (30-minute drive) find shops, restaurants and Colby College with its beautiful Museum of Art (free to the public); a perfect excursion for a rainy day. Augusta is also nearby (20-minute drive) for shopping and a movie theater. 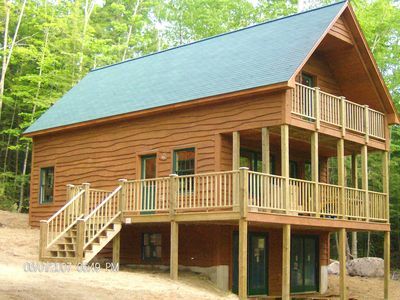 Be one of the first families to stay in this spacious and comfy rustic Maine camp. It is furnished simply but comfortably. There is a deck with gas BBQ grill. Unlike most camps, the tap water comes from a well, not the lake. The home is situated as close to the water as new rules will allow, 100 ft from the lake, surrounded mostly by trees with peeks of the water. The private waterfront area which is exclusive to guests consists of a swimming area and dock extending out over the water. There is also an offshore boat mooring for your boat. 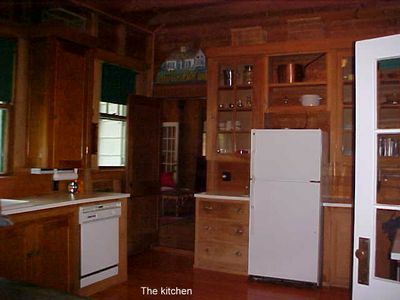 The main level offers a roomy kitchen with dishwasher. The dining area and living room are open to the kitchen making for a spacious, open floor plan. The main level also has two french doors opening to a deck which overlooking the lake, providing a perfect to spot to BBQ, relax, or read a book, or just enjoy the wonderful natural setting. There is a bedroom with a queen size bed located on the main level and the bathroom is also located on the main level. Up the stairs there are three bedrooms consisting of a large master bedroom with a king size bed and optional full size sofa-futon. There is another queen size bed in one of the upstairs bedrooms, as well as another bedroom with two single beds. 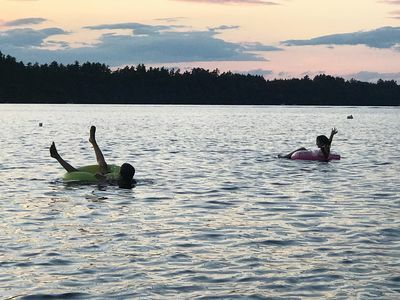 Tons of Fun at the Waterfront From this very popular location on the Eastern side of Pinkham's Cove, you can boat all over Great Pond, ride your boat in to Belgrade Lakes village, and enjoy picture-perfect sunsets. The Belgrade Lakes area is known best as the inspiration for the story and film On Golden Pond. The lakes in the area (7 beautiful interconnected lakes) offer great boating, fishing, water skiing and of course swimming. Enjoy the day at the lake or going through the countryside shopping treasures and antiquing. If you prefer a game of golf, the highly acclaimed course in Belgrade Lakes Golf Course is located just minutes away. A day trip to Bar Harbor, Freeport or Camden lets you enjoy more of what the great State of Maine has to offer and all are easily accessible from Belgrade. Bring your boat or rent one and spend the day on any one of the seven incredible and beautiful lakes in the area. Boat/kayak rentals are easily available at several locations nearby. 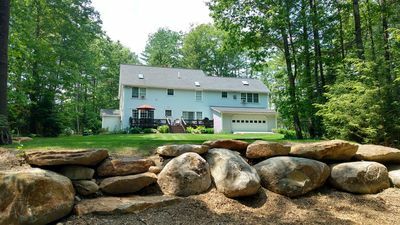 This custom family home is equipped with everything a family needs and desires for the ultimate Maine Summer Vacation. 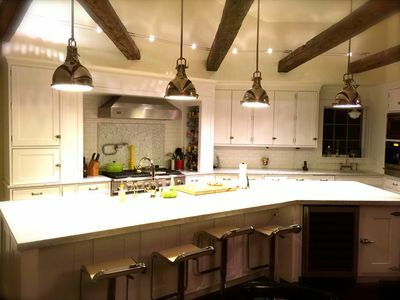 Reclaimed wood floors, beams, a chef's kitchen, (7) bedrooms, (7) full baths and (2) half-baths. The walk-out basement is fully equipped with a copper bar, ping-pong table, workout room and 80" flat screen TV. There is a place for everyone in this home but you will most likely find your friends and family settling in at the kitchen island or on the beautiful screened in porch. And in the evenings relaxing on the dock watching the sunset...bliss! 100' + of water frontage in Pinkham's Cove Great Pond. Very clean and clear water, great swimming and fishing. Great place to relax and enjoy water sports. Boat or drive into downtown Belgrade to shops and restaurants, Belgrade Lakes Golf Club Ranked #1 in the State minutes from your stay on the lake. Christy's Country Store 1 mile away for pizza/take out/gas or any forgotten items. Close to Farmington or Augusta. 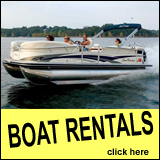 Boat rentals available pontoon, ski/fishing, kayak/canoe. You'll love our family cabin on Pinkhams Cove for the natural beauty, sandy beach. shallow swimming area, crystal-clear water, boating. fishing. and campfires. Enjoy the harmony of loons as you relax on your front porch, the water-front dock, or lake-side gazebo. The property is close to beautiful Belgrade Village, the Augusta Mall, Colby College. Thomas College. and Freeport Outlets that are just 45 minutes away. Close to Augusta, Oakland, Belgrade Lakes Region, Waterville. Nearby golfing, dining, hiking, museums, shopping,day spas, movies, summer theaters, music camp, berry picking & horseback riding. Camp Betty has a limit of 8 guests. Linens/blankets/pillows provided. No campers or RV's, please. Weekly or monthly rental only. There is a horseshoe pit, outside fireplace with gathering area, space for lawn games such as volleyball, bocce ball, & croquet. Fishing, birdwatching, nature study, walking trails, swimming & boating. Hosts available for check-in, check-out, and as needed. 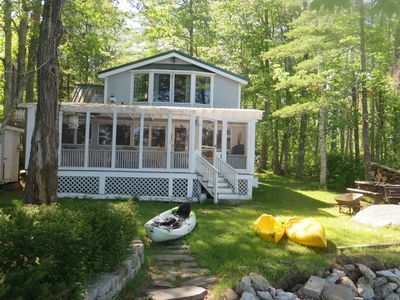 Our charming, cozy cottage with character has 250' feet of unparalleled waterfront privacy. It is located on the tip of a point, with panoramic waterfront views, on tranquil Ward Pond. Our property is perfect for swimming with either a gradual lawn entry or a jump from our dock. Ward Pond has very warm, crystal clear water to cool you off on a hot day. In addition, we have the shade of majestic 100' pine trees. This property is a rare find to say the least. Built in 1940, but completely updated since 2005, it gives you a unique feeling of a traditional Maine cottage with a touch of upscale living. The beautiful living room has the original wooden floors and an unbelievable fieldstone fireplace that gives the feeling you are deep in the woods of Maine. But don't be completely fooled! It has new furniture with two recliners, a 55" flat screen HD TV with cable, and wifi that reaches the entire property. It also has a monitor heater for those chilly nights. Our fully functioning kitchen has modern appliances and a full size refrigerator to allow home cooked meals. Our bathroom has a full sized shower/tub combo, a washer and dryer, and a monitor heater to take the nip off if it gets a bit cool. Bedroom #1 is located on the main floor with a queen size bed with a new mattress. The room is smaller, but has a dresser and a closet. Bedroom #2 is located upstairs. It is a large, enclosed loft and is very spacious. There is a sleigh bed with a brand new king size mattress, a bunk bed with a twin on top (meant for a child) and a full size bottom mattress (again new mattresses), and a closet with many dressers. The A/C upstairs will make sure sleeping is comfortable on those hot nights, or you can open the windows and let the breeze from the lake lull you to sleep. Morning coffee on the sun porch, or outside on the deck? Relaxation is a given. How about sitting in the Adirondack chairs lakeside next to the fire pit? Whatever you choose it will be perfect! Fire up the Weber gas grill for the family cookout and use our family size picnic table, or go for a paddle on our kayaks. Listen for the loons, watch the ducks, and have a campfire at night in our fire pit. Located only 7 miles from the heart of the Augusta shopping district and the nearest Interstate exit, convenience is a short distance away. A location close enough to get to, but far enough away to forget where you are. Four of the best golf courses in central Maine are within a 25 minute drive. An hour away from the Maine coast. This cabin is one of few remaining original structures from the once popular cottage community called "Log Haven". 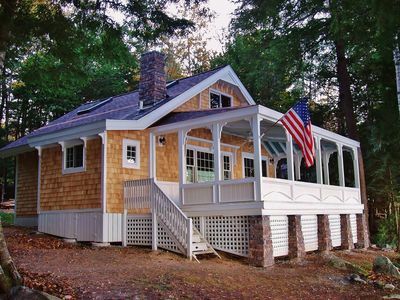 Located a very short walk from the shores of Great Pond, "Cabin 8" is your home away from home. Sitting in the living-room or on the screened front porch one can see reflections off the lake. The log cabin is sunny, inviting, spacious, and homey. The three bedroom, one bath "camp" is the perfect place to spend your days reading and relaxing. 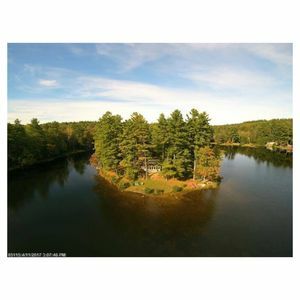 Or you can hang out on your personal lakeside dock for swimming, boating, or counting the loons. Because of our location on Great Pond's prime eastern shore, most evenings are spent dockside watching the golden sunset; henceforth, the nickname for Great Pond as being “Golden Pond.” The log cabin was originally built in the 1950’s. Walls came tumbling down when we renovated Cabin 8 in 2011. Now a large great room combines the living, dining, and kitchen spaces. A new wood stove has been placed within the old stone fireplace. The camp is cozy and elegant, tastefully decorated without being stuffy. There is a screened porch that has a sitting area as well as a dining table. One can sit on the porch to read, have a meal, or listen to the birds. An additional outdoor deck gives space to sip morning coffee in the sunshine. The master bedroom has a queen size bed. There are two additional bedrooms each outfitted with a set of twin beds. 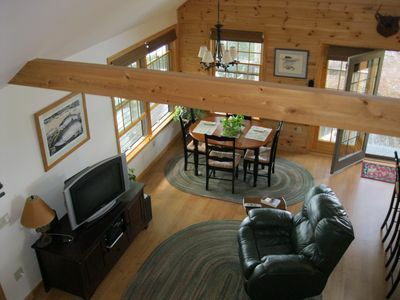 All three bedrooms open to lovely views of the Maine woods. The bathroom has a full shower. Great Pond is known for the quality of its water. The lake is pristine. The topography of the shoreline at our camp allows children to easily swim along the rocky shallows of the lake. There is a gradual slope to the lake bottom so the water is shallow enough for children to easily swim, yet at the end of the dock the water is deep enough to allow for easy access for a power boat to get in and out from the dock. Kayaks, canoes, row boats, sailboats, power boats and pontoon boats are all welcome. Many a smallmouth bass has been caught right from the dock or from a boat trolling the lake. Fishing is fun on Great Pond. We are located 15 minutes from Waterville or 20 minutes from Augusta. One can find fine restaurants, shopping, and other amenities in both locations. Local airports are Augusta (20 minutes away) or Portland (one hour fifteen minutes away). Talk to us about discounts for renting successive weeks. Welcome to the cabin where the hobbits must live- talk about charm! This cabin is one of few remaining original structures from the once popular cottage community called "Log Haven". 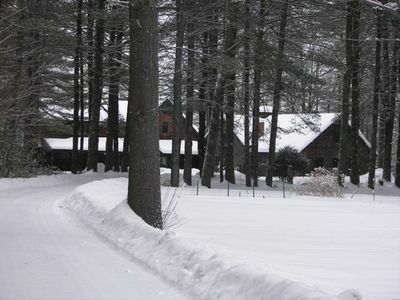 Located along the banks of Great Pond, "Cabin 6" is a unique property. The log cabin is quaint, loaded with charm and ambiance. It is a reflection of what the old Maine camps once were, yet has been completely modernized. The spirit of the camp nudges our guests to relax and settle in for a memorable vacation. The inside of the cabin is warm and enchanting. An open floor plan blends the living, dining, and kitchen spaces. The fully equipped kitchen invites one to create sumptuous feasts for family and friends. The cabin is warmed on those chilly mornings or nights by either the efficient wood stove or a Rinnai heater. The cabin has a master bedroom with a double bed and a second bedroom with built in bunk beds. An old fashioned open air, screened sleeping porch with two twin beds provides the sleeper with nightly serenades from the loons or the sound of the wind and the waves. The screened porch has a small seating area- another cozy place to watch the waterfront. The cabin's dock is steps away. You can hang out on the dock for swimming, boating, or counting the loons during the day or the stars by night. Because of the location on Great Pond's prime eastern shore, most evenings are spent dockside watching the golden sunset; henceforth, the nickname for Great Pond as being “Golden Pond.” Great Pond is known for the quality of its water. The lake is pristine. The topography of the shoreline at our camp allows children to easily swim along the rocky shallows of the lake. There is a gradual slope to the lake bottom so the water is shallow enough for children to easily swim, yet at the end of the dock the water is deep enough to allow for easy access for a power boat to get in and out from the dock. Kayaks, canoes, row boats, sailboats, power boats and pontoon boats are all welcome. Many a smallmouth bass has been caught right from the dock or from a boat trolling the lake. Fishing is fun on Great Pond. We are located 15 minutes from Waterville or 20 minutes from Augusta. One can find fine restaurants, shopping, and other amenities in both locations. Talk to us about discounts for renting successive weeks. Welcome to our home! Yes, this is where we live! But sometimes we like to travel to other places, so we open it up for guests. We built our high-end waterfront home thirteen years ago. It has all of the amenities we like, including lake views from most rooms, a large cherry dining table with plenty of chairs, a Sub-Zero wine cooler, dishwasher, large TV in the central common area, laundry room upstairs, carpeted bedrooms, and high-speed wifi. When you're ready to swim or wade, you can walk right into the lake. It’s not like a lot of our neighbors places - you won't need to cross a birm, go down a hill, or make your way down stairs. The lake-bottom is sandy/rocky - no moss, muck, or weeds here! The water is clean and clear, no algae blooms or mysterious floaties. Our dock & mooring are included for your stay. Bring your boat, jetski, canoe, kayak, or other water toys, the yard and shoreline have plenty of space! Our garage is included with 2 bays for your use. Our paved driveway is level and great for kids to play in, ride bikes, etc. 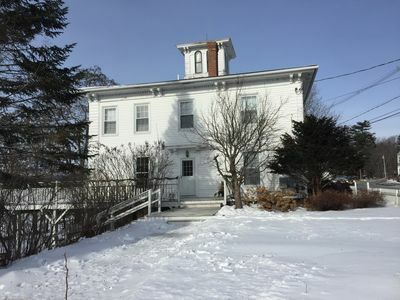 The location is convenient - mid-way between Waterville and Augusta. You can drive to town in 17-20 minutes for restaurants, groceries, and entertainment, or to get on the interstate in either direction. Much less driving than if you stay on the other side of the lake! 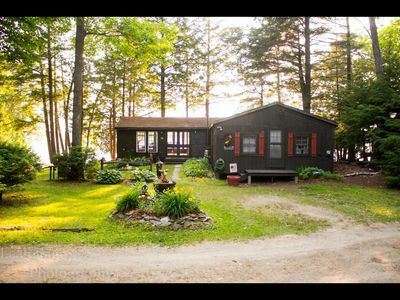 Teaberry Cottage has all the modern comforts of a home with the peaceful lake front setting of a cottage. 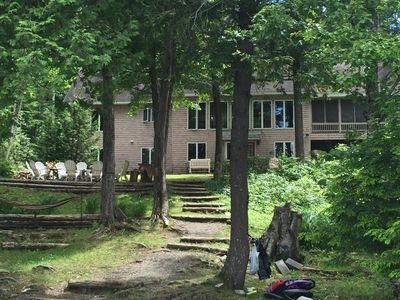 This 2,900 square foot, 4 bedroom 2 1/2 bath home on Ward Pond can easily accommodate 11, (8 in beds, two hide-a-beds and one pull out mattress under the bottom bunk bed) Relax in a picturesque setting with beautiful gardens and landscapes, surrounded by woods on three sides and the lake on the other. Enjoy granite kitchen counters, stainless steel appliances, a dinning table for eight and kitchen island seating for four. Hardwood floors throughout with luxury bedding and linens. The master suite has a gas fire stove, a private shower and soaking bathtub and a beautiful morning view of the lake from your king size bed. There is an Upstairs laundry with a large second full bath and a half bath on the main level. B-B-Q or steam lobster off the back deck. Large dock allows sun bathing down on the water or venture out to the swim dock. Fun bass fishing, or just lounge in the pristine water. Property provides its own kayaks (5), small bass boat upon request, and a paddle boat. Safety vests available. Camp fire with wood provided. Plenty of on site parking. Want to jet ski or water ski on a large lake? Launch just a few minutes away at Messalonskee boat launch free to the public. 10 minutes to Belgrade Village, I-95, and all the Augusta amenities you need, including dinning, Regal movies, WalMart, Barns and Noble, Michaels and more. Enjoy golfing in Belgrade or hiking local trails. Shop the quaint Belgrade village or drive 40 minutes to shop LLBean and Freeport's extensive outlet shops. Plan a fun filled day of rafting on the Penobscot River (Reservations required ahead of time per availability) Teaberry Cottage sits center of the state and affords many site-seeing options, museums and parks including Acadia National Park, the beach, or Colby College. Rest and relax or adventure and explore. Our business is to make sure you enjoy a vacation away from your business. Beautiful year round waterfront home located on McGrath Pond. Easily accommodate 14+ People. Air conditioned throughout, WIFI and Cable TV. Main level has open floor plan with master bedroom, second bedroom, family, dining area and fully equipped kitchen. Upstairs has large bedroom and full bath. Downstairs in law suite has 3 bedrooms, large familyroom, and kitchenette with private french door entrance. Washer and dryer located on main level. Screened in porch, Front Breakfast Deck and large paver back patio. 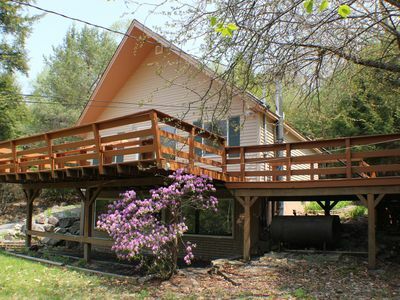 Oakland Cottage w/Deck - Right on McGrath Pond! 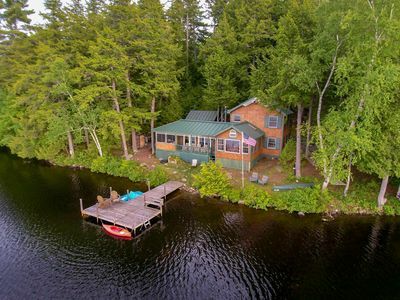 Picture yourself in the Belgrade Lakes region on one of the best lakes in Maine*** Great Pond***. The lake where the story "On Golden Pond" was written and then later made into a movie. 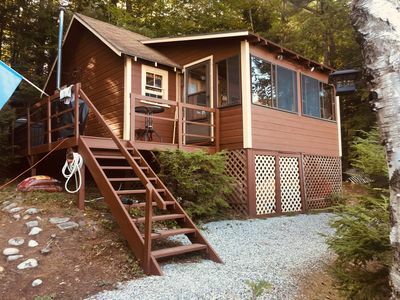 This quaint cozy 2 bedroom cottage is 15 feet from the water on 100 feet of frontage. Clean water, swimming, boating are some of the great features of this cottage. The cottage sleeps 4-5 with a large master bedroom with a queen size bed and a smaller bedroom with bunk beds. There's a day bed on the porch. All the bedrooms have an LCD TV with a DVD player and Free Wifi !!!! It has one bathroom with shower. Also, there's a picnic table. This a non-smoking property. Downtown Belgrade is just 10 minutes away with restaurants, country store. One of the State of Maine best Golf couse is near by. There is also a marina on the lake that rents boats etc. (Rowboat, Canoe at the camp available). Kyacks are available for rent at a rental store about 2 miles away. Augusta is just 15 minutes away with all the amenities you could ask for. Bring your own bed linens we supply the blankets and pillows. Linens are available at additional cost. 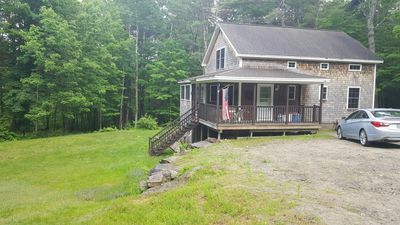 Nestled on a hill within 20 acres of forest at the end of a dirt road is this adorable cottage with 4 bedrooms and two baths, an open kitchen living room, and a small sun room. A covered porch wraps around two sides of the house with a lower lawn area that leads to the dirt road, which continues all the way to the water - Belgrade Stream. This stream connects to Long Pond where this is a public boat launch (there is a canoe and a private dock owned by the camp). 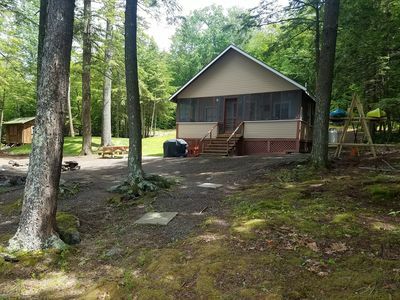 Located just west of Augusta, this property is within the beautiful Belgrade Lakes community -- peaceful, picturesque, and welcoming - Central Maine's premier lake area for recreation, relaxation, and wholesome family fun. Famous for its sparkling scenic streams and chain of seven lakes, its panoramic views of fields, hills and woodlands, its inviting towns and villages, and its activities for all ages. The area boasts the following activities: Boating/Water Sports Shopping Dining Hiking Fishing Farmer's Market Seasonal Events Golfing Swimming Biking Tennis Canoeing/Kayaking Ice Fishing Cross-Country Skiing Snowmobile Trails Wildlife and Wildflower Viewing Main floor has a full bath and 2 bedrooms, one with a queen and the other with a full bed. 2nd floor has another full bath and two larger bedrooms: one with 2 full beds and the other with a full bed and 2 twins. Renters will supply their own linens - sheets, bath towels and kitchen towels. There are some at the house. If you should need to use some, you are welcome to do that. You must wash and dry them before leaving. Hiking/walking trails and snowmobile trails are right from the cottage property line. Available September 1, 2017! Beautiful 3 bedroom home in one of Waterville's finest neighborhood. Minutes to Colby College and beautiful Belgrade Lakes Chain. Less than an hour to Maine's beautiful coast. Offers large living - dining room combination, large kitchen and 3 bedrooms on main level. Large living room with Bar/entertainment area on lower level with washer and dryer and 2nd bathroom. 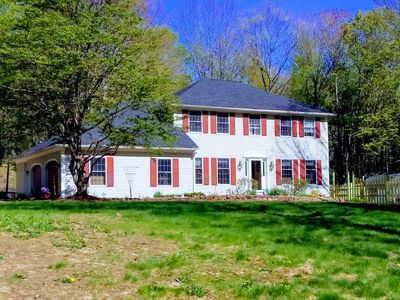 The perfect home for families visiting Colby College or looking to explore all Maine has to offer. Welcome to the Lake House! Located one town away from Colby College, Thomas College and Kennebec Valley Community College. About an hour from the Atlantic Ocean and Sugarloaf Mountain. 5 bedrooms. Access to boat mooring. Newly 2018 renovated full bathroom and kitchen. Bedrooms have locked doors & WiFi. This cottage has a Deck and Docks, new BBQ Grill. Lakeside Bon Fire Pit. Full bath, 30 feet from Lake! 2 entrances. Includes an older row boat and paddle boat, 2 Kayaks, Fishing/Swimming. Neighbors include Camp Manitou, Matoaka and Somerset, and a summertime movie star. 300 feet from the Public Boat Landing. Near country store. I reside nearby and will help with any issues. My house is 30 feet from the shores of East Lake. Swimming, boating, fishing ice skating, walking are some of the great activities that happen at the Lake-house. Newly purchased 5,000 BTU and 100,00 BTU portable air conditioner for second floor.. First floor is fully air conditioned. The house has a large driveway and is surrounded by a forest that is owned by my mom and Camp Manitou for boy. You will have access to Wi-Fi and the 50" 4k Smart TV. The Master Bedroom has a queen size bed and smart TV. It also has an adjacent daylight room with 3 windows. The second bedroom has 2 bunk beds and a daylight room with a futon and Apple TV. The third bedroom has a full bed and a twin bed and 2 windows that overlook the lake. The fourth bedroom has a new twin bed and window that overlooks the lake. The 5th bedroom has a twin bed, one window and is fully air conditioned. This room is located on the first floor across from the bathroom and near the house entrance. Tucked away on Benson Cove, you'll find this lovely waterfront cottage ... sun, fun, and serenity set in a tasteful mix of 100 year old charm, classic Maine cottage style, and modern comfort and amenities. 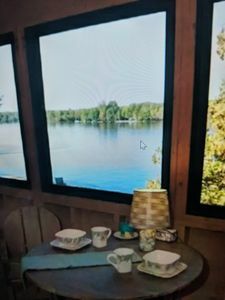 Add to this breathtaking views of the lake and gorgeous sunsets, the sound of the loons, and you too will call this your 'happy place' as one of my guests does! 4 bedrooms, 1 1/2 baths with washer/dryer. Kitchen amenities include stove top, oven, microwave, and coffee maker. Fish for bass off the dock in the morning, then spend the day on the lake kayaking or canoeing, or just relax all day then enjoy a beverage while you watch the gorgeous and ever-changing sunsets. The property has a beach area for easy entrance into the water so it's perfect for little children, as well teens and adults to put in kayaks etc. 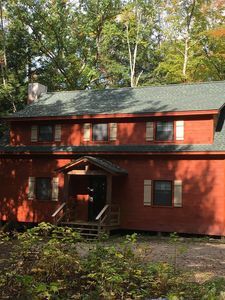 The cottage is about 15 minutes from Colby College and the town of Waterville, and if you have children at summer camp in the area and will be visiting on their family weekend, the house is only minutes from camps situated on East Pond yet neither camp is visible from the property. Quiet neighborhood, end of cul-de-sac. Year-round hot tub off living room. In-ground pool, with new heating source. We do check on the pool and hot tub every other day for the safety and comfort of our tenants. New hardwood floors. Granite counter tops in kitchen. Ceramic tile floors in kitchen and bathrooms. Formal dining room. Plenty of space for children to play, toys & bikes provided. Cable & internet (WiFi) provided. Operational fireplace in living room. All beds have new mattresses, pillows and linens. Quiet neighborhood, end of cul-de-sac. Year-round hot tub off living room. In-ground pool, hope to have it operational this year (as house has been vacant for 3 years). New hardwood floors. Granite counter tops in kitchen. Ceramic tile floors in kitchen and bathrooms. Formal dining room. Plenty of space for children to play, toys & bikes provided. Cable & internet (WiFi) provided. Operational fireplace in living room. Light filled, beautifully updated studio apartment in small apartment building 5 minutes from downtown Augusta. 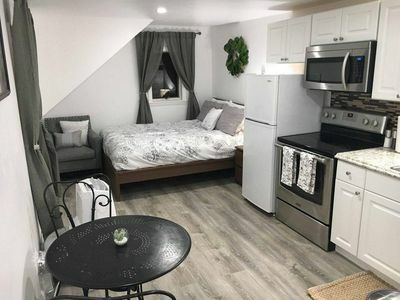 Full-sized stove/oven w/ pots/pans, microwave, dishes, silverware and cooking utensils, refrigerator, beautiful queen-sized bed with luxury mattress. Luxury sheets and linens and closet to hang your things. If you need to do laundry, there are two washers and two dryers in the basement. It costs about $2.50 to do a full load (includes washing + drying). Free off- street parking in a parking lot. We provide free access to Netflix and Amazon Prime TV. 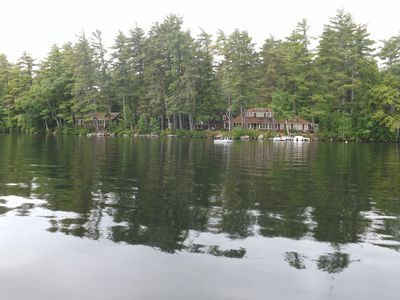 This is a beautifully built cottage with a wonderful view of the south end of Long Pond. It is on a sheltered cove with great swimming and snorkeling. The camp has a large deck for entertaining, a full dock, and steps that make entering the lake very easy. The interior is comfortably furnished and almost completely paneled with tongue and groove hemlock. There are ample closets and dressers, a fully equipped kitchen, a cable served flat screen TV, as well as Wi-Fi. A row boat, a canoe, and life vests are available for your use. Light filled, beautifully updated studio apartment in small apartment building 5 minutes from downtown Augusta. Full-sized stove/oven w/ pots/pans, microwave, dishes, silverware and cooking utensils, refrigerator, beautiful queen-sized bed with luxury mattress. Luxury sheets and linens and closet to hang your things. Perfect for either a short term rental although many of our guests stay for several weeks or longer. Very convenient to the best of Augusta and a great stopping point on your way up to Acadia/Bar Harbor. As you enter the private gated entrance to The Cottage On Ingham Pond and descend through our fields, you will be in awe at the most picturesque vista in the Belgrade Lakes area. So beautiful a sight that it has been featured twice in Down East magazine. 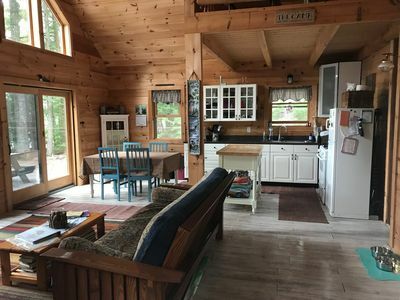 Located 10 feet from the waters edge on pristine Ingham Pond, The Cottage On Ingham Pond offers easy boating access to Long Pond and Belgrade Lakes Village. A kayakers heaven!! Standup paddle boarder's heaven!! Fisherman's heaven!!. We have a lot to offer. 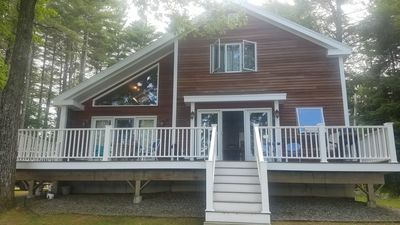 Comfortable, cozy, peaceful, private, bright and cheery with all the amenities best describes The Cottage On Ingham Pond. The western exposure provides awesome sunsets across the water. Tastefully decorated to sleep 8 with a first floor queen size bedroom. The second floor has 2 bedrooms. One bedroom has a full size bed located directly under a large skylight so that you can enjoy the starry nights. The other bedroom offers a full size bed and bunk beds. Spacious first floor bathroom with a shower. An outside privy is also in place if so desired. The open floor plan with large windows includes the kitchen, dining area and family room with a Direct TV flat screen. WIFI is in place and can be utilized while sitting in the Adirondack chairs on the large T shaped dock or in one of the hammocks. We have a deep drilled well that provides some of the best cold drinking water that you ever drank. No need to buy bottled water. Linens and towels are provided along with a washing machine and dryer for your personal use. There is a covered front porch and a large screened porch. The screened porch has a table with chairs and rocking chairs so that you can enjoy the evenings outside bug free listening to the loons and owls. 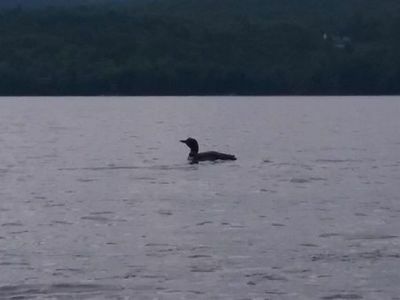 Every year Ingham Pond is home to a loon family that likes to hang out in front of The Cottage and entertain our guests. WE STRICTLY FORBID JET SKIES AND WAKEBOARD BOATS. For your boating and swimming pleasure we offer 2 kayaks, 1 canoe, a paddleboat for the kids or young at heart and a swim float. Fishing boats can be rented from Castle Island Camps and Belgrade Boat Rentals. 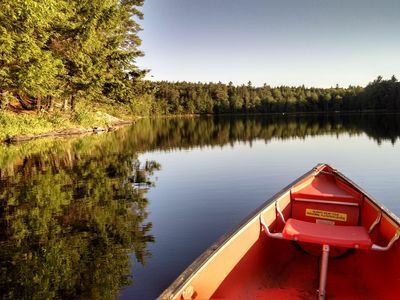 If you bring your own boat you can launch it at the public boat launch on Long Pond and take the scenic cruise down Long Pond and Ingham Stream back to The Cottage. Ingham Pond is a prized fishing area known for its large Pike, Large and Small Mouth Bass and Black Crappie. The record Black Crappie for the State of Maine was caught in Ingham Pond in 2013! Smoking is not allowed inside any of our buildings. Any butts must be disposed of in the outside fireplace. Besides the outside fireplace and woodshed there is a charcoal grill for barbequing. While staying at The Cottage On Ingham Pond, you should go up to the field on a clear night and check out the Milky Way Galaxy. It will appear directly overhead and is really something to see. Centrally located on the several hundred acres of our property, we offer vast undisturbed water frontage and miles of private gravel roads, trails and breath taking views to make your Maine stay memorable. WE ALSO OFFER "GOOD TO GO GROCERS". While staying on Ingham Pond, we can now offer you delivery service for your groceries upon arrival if you'd like. If you are interested or have questions please contact owners. Check in is anytime after 2pm. Check out is 10am. 3 Bedroom 1 bath house that could sleep up to 7 people. This ranch style house is located just outside the Belgrade Lakes Village so you can easily walk into town. Just around the corner you will have access to Long Pond swimming and enjoying the views of the water and the mountains in the distance. There are kayaks for you to use, with life jackets. You can enjoy a fire in the backyard in the evening and cookout on the grill to enjoy your time away. Guests are sure to enjoy a memorable vacation in this fully renovated 1920's summer cottage formerly known as the Bradbury Cottage. 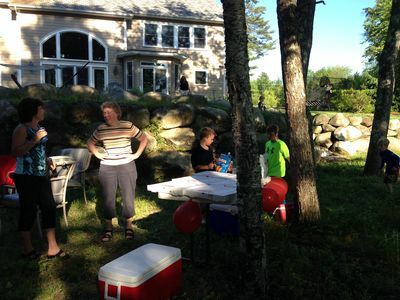 It is located on the western shore of Three MIle Pond. 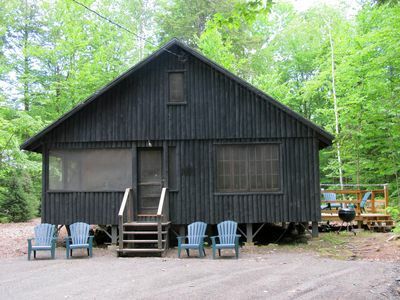 The cottage is on a relatively private double lot with woods on one side and the lake on the other . Three Mile Pond is well known for its large loon population and great fishing for large mouth bass. Spacious living room/dining area with sliding glass door to wrap around deck with great lake views. Guests can enjoy a beautiful sunrise while relaxing in the morning hours on the wrap around deck.Spacious living room area has a brick fireplace with wood stove insert. Fully equipped kitchen includes new appliances including microwave. Master bedroom with vaulted ceiling and skylight. Master bedroom has two full time sleeper/sofa futons for sleeping /relaxing comfort and can easily sleep four. Cozy guest bedroom with bunk bed (full and twin). 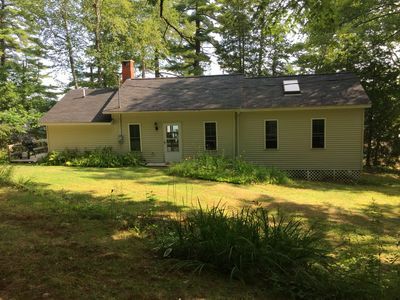 Cottage has a full bath and knotty pine interior with yellow pine floors throughout. Small deck on lake frontage with dock and float. Situated on the water with two kayaks and a canoe for enjoyable water activities. In late August, guests can enjoy the nearby famous Windsor fair. The cottage is located near Augusta, Waterville, Belfast and approximately 30 minutes from some of Maine's beautiful coastal towns, lighthouses and beaches. 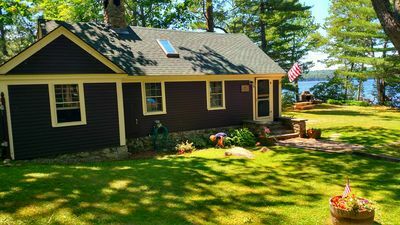 The Waterfall Cottage, located in the quaint area of Belgrade Lakes (where the author of the iconic book/movie “On Golden Pond” summered and wrote about) sets as the perfect back drop for our classic Maine cottage. 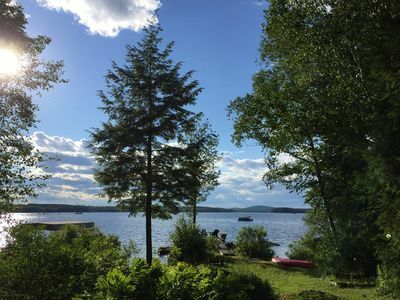 Our lake (Long Pond) is a part of a chain of 7 pristine lakes known for its mountains meets the water with ideal swimming, boating, canoeing and some if the best fishing in New England. Now going into our 17th summer, our four bedroom cottage perched between a waterfall and the lake is only STEPS from the quaint Village that has everything from farmers markets to mom & pop shops, casual & fine dining, 5 star golf course, and the famous "Days Country Store" (where you can find everything from fishing tackle, coffee/ newspaper, to all your groceries...you won't need to even leave the area during your vacation). Only 15 miles to Augusta, and Waterville, our lake home is conveniently located close to the coast as well (45 miles from Freeport/outlets/LL Bean and just over 1 hr to Portland/jetport and many of Maine's mid COASTAL area). The Waterfall Cottage has been creating wonderful family memories and vacations for summers, whether its a bbq on the water's edge on the communal stone fireplace, taking in the most beautiful SUNSETS, or falling asleep to the sounds of the loons and the waterfall on the side of the house, our home will create long lasting memories for your family. Private shared waterfront: Our home is part of a PRIVATE “shared” waterfront known as The Village Camps, established in 1940s and once owned by the Wrigley’s of Wrigley field. 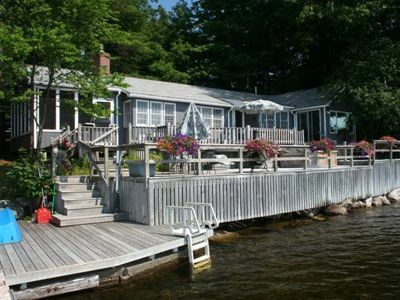 This private waterfront has 7 Independently owned cottages that EACH have their own land/private dock. We share 350 feet of additional water frontage and an acre of land including a communal boat slip/marina for larger boats, unlimited wood in the wood shed, trash removal service, maintenance of lawns. Our PRIVATE large Dock has stairs that lead down into sandy shallow bottom with about 3 1/2 to 4 feet of water (when water is high) which is great for kids. We have kayaks and canoes and space to tie up your own boat if binging one under 18 feet. RESERVATIONS: we rent Mon-Mon. Summer of 2019 is already booked from June 4 thru August 19th. However, we still have a few weeks and weekends in mid May thru June 3 and Aug 19 thru mid Oct. Reservations are taken on first come first serve and held with a 50% deposit of the weekly rental. Please see my rates and calendar availability. I do consider three night minimum’s only in May and June and September and October months. My weekly calendar in the summer typically is mon -mon. Fall weeks we have more flexibility with check in days and times. CHECK-IN: Check in anytime after 2 pm and CHECK-OUT 10am sharp!!. Looking for quiet families who will treat home like their own. Since there is only one full bath, we recommend no more than seven persons But the home will sleep eight. RENTAL AGREEMENT: *$250 SECURITY DEPOSIT, PLUS 50% OF BALANCE DUE WITH IN 7 BUSINESS DAYS OF EMAILED CONFIRMATION. BALANCE DUE 60 DAYS PRIOR TO ARRIVAL (unless otherwise noted). ANY CANCELLATIONS WILL BE REFUNDED ALL MONIES ONLY IF WE CAN RE-RENT YOUR WEEK. 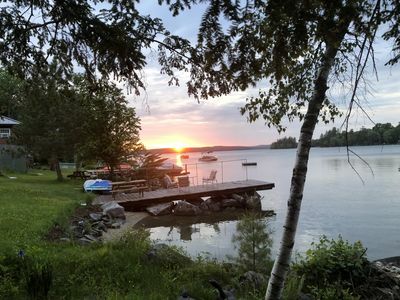 (Per case basis) Keywords: Lakefront Cottage steps away from quaint village of Belgrade Lakes with the most spectacular sunsets, great fishing, swimming & kayaking. Home comes with two kayaks and canoe. Ideal for families or couples. Pets welcomed. Find your peace and privacy in the over sized master bedroom with queen bed, private bath and sitting area with magnificent views overlooking a private island. Large guest room boasts twin beds and private bath. Screened-in sleeping porch features a queen bed and bath. 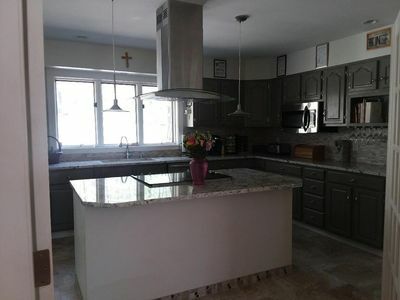 Fully applianced kitchen with center island seating, skylights and gas stove. Very large living room features vaulted ceiling, gas fireplace, overstuffed couches and surrounding windows. Adjacent dining room has a table that seats up to 8. House contains a full laundry room. 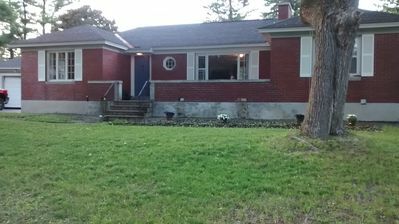 Rear yard has large lawn and room to play. A perennial garden offers fresh flowers for your tables. Back deck has gas grill. Front decks have a 6 person hot tub, a large picnic table and additional tables with umbrellas. House comes with 2 kayaks and a rowboat, which you can launch from the attached dock. There is a swim float for jumping, diving and sunning. Large, private, seasonal (May-October) waterfront compound, ideal for larger gatherings of friends or family or special events. Three buildings, each with screened porches, fireplace and full service kitchen with all modern amenities. The Main house offers expansive lakefront screened in porch, music room, formal dining room, 6 separate entrances, 5 bathrooms, 4 bedrooms (two with twin beds plus a queen), great room and more. The Lake House offers 4 bedrooms, 1.5 baths, screened in back porch, living area, dining room, kitchen and screened in front porch. Finally, The Boat House offers 2 bedrooms (one room with two sets of bunks and one master bedroom) and 1 bath with living area, full kitchen and 2 screened in porches. Centrally situated on the property, the screened gazebo offers outside dining if desired. Located within walking distance to Belgrade Lakes Village, this unique property offers easy boat access, 2 docks complete with moorings, swim up float and play area for children. Updated Maine cottage boasting a wrap around redwood deck. We are at the end of a lane with only four other cottages offering complete privacy on one side with an expansive lawn and rock wall. Walk down steps from the deck and you are on the dock with a beautiful open lake view of Great Pond. The cottage includes a master bedroom with bath, two guest bedrooms with guest bath and a sleeping loft in a cathedral ceiling "great room". There is a full kitchen open to the first living area. The great room has a mini kitchen which includes a fridge, sink and micro wave. Off the great room is a screened in porch. Washer, dryer, Dish TV and Internet are all included. The cottage is only 15 minutes from Waterville and Colby College and only 10 minutes from Oakland. In addition the cottage offers two paddle boards and a canoe. There is also a charcoal grill. Needless to say, the lake is the central point of all the activity. Swimming, water skiing, fishing or boating offer endless fun. On the lake there is also a highly rated golf course. 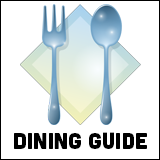 Great dining is available, especially the Village Inn in Belgrade Lakes Village. Bring your own bed linens. We supply blankets and pillows. Astounding beauty, peace and quiet abound at on Great Pond. During peak season, (End of June through August), we rent on a weekly basis, Saturday to Saturday. The Lakeside Inn in Belgrade Lakes Village-Walk to everything!!! The Lakeside Inn is a 1800's Historical property on the shores of Long Pond in Belgrade Lakes Village, Maine. This unique and beautiful Inn offers 5 ensuites, which include queen size beds and one with two twins and sitting areas. Complimentary beverages in all rooms and high speed internet service. 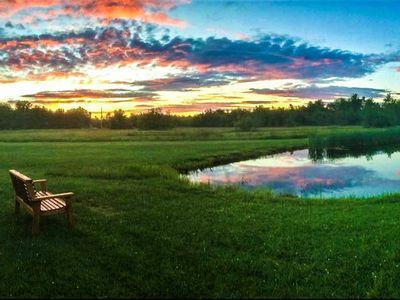 The Inn has almost 200 feet of private waterfront, multiple docks, a large deck over looking the water, a great lawn with adirondack chairs and we can't forget the amazing sunsets! Located right in town, you can walk to everything, Day's store, The Village Inn, The Sunset Grill, Belgrade Lakes Golf Course and local shops. What more could you ask for??? The Lakeside Inn is an 1800's Italianate Historical property on the shores of Long Pond in Belgrade Lakes Village, Maine. This unique and beautiful Inn offers 5 ensuites, which include queen size beds and one with two twins and sitting areas. Complimentary beverages in all rooms and high speed internet service. The Inn has almost 200 feet of private waterfront, multiple docks, a large deck over looking the water, a great lawn with adirondack chairs and we can't forget the amazing sunsets! Located right in town, you can walk to everything, Day's store, The Village Inn, The Sunset Grill, Belgrade Lakes Golf Course and local shops. What more could you ask for??? For larger events, please send a message and we can give you a quote. The basement has a brand new commercial kitchen which can be included in the rental fee for any event. Chalet style summer cottage nestled on Hoyt Island on Great Pond. Loft sleeps four comfortably with an additional two bedrooms downstairs, a queen and a trundle bed. Open concept with a full bathroom and kitchen. No outhouse here! Large deck for entertaining and large fire pit close to the water. A charcoal grill is available for use. There is a boat mooring and a dock with a ladder. Lobster pots are on premise for use. A spectacular spot to summer vacation in Maine! A BOAT IS REQUIRED FOR THIS RENTAL! 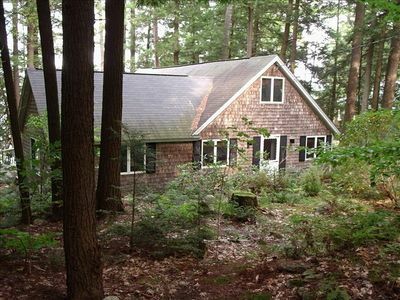 Peaceful lakefront cottage nestled among towering pines and hemlocks! Quintessential Lakefront Cottage with Amazing Views! A classic Maine vacation destination! Ernest Thompson stayed on Long Pond while writing his 1979 play "On Golden Pond". Our property has one of the nicest views on the south end of this famous lake, and you can enjoy it all from inside our 12'x24' screen deck. This custom designed cottage offers all the privacy and amenities you are looking for in a vacation rental. Ideal for a couple, couples or small family looking for a relaxing retreat to kayak, fish or boat. We offer a brand new kitchen, bathroom, and three bedrooms with two queen beds and two built in twin beds. Everything is new and high quality, including the linens, dishware and cooking utensils. We also have a washer and dryer, WiFi, swim platform, large floating dock, mooring, and many miles of quiet tranquil roads to walk your pet or jog. Long Pond offers nearly 3,000 acres of beautiful Maine waters with islands, pines, loons and bald eagles. More than enough for a great week of kayaking, boating or whatever your summer interests are. Long Pond is a deep, clear lake and great for swimming. 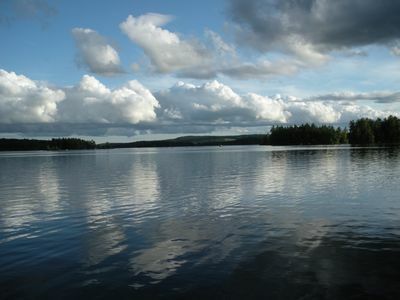 Of all the Beldgrade Lakes, Long Pond is the least developed and most pristine. Drive or go by boat to the town of Belgrade Lakes for dinner or ice cream. 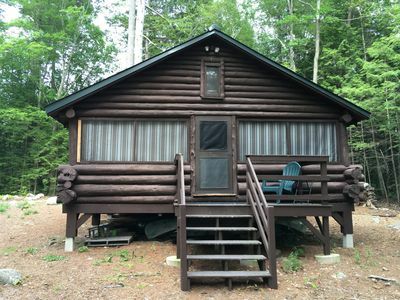 A classic summer vacation area, Long Pond and the Belgrade Lakes area are sure to please. Approximately 3 hours from Boston.